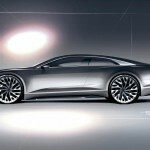 Audi design is now expressing progressive technology even more powerfully. The two-door coupe has a flowing, elegant shape and taut design. Its forms and lines are unmistakable and introduce many new ideas. In the clear and unobstructed interior, the architecture melds with the display and operating concept to create a new type of unit. The entire front of the instrument panel is a large touch display, and a portion of the user interface operates with a new type of OLED display made of organic LEDs. The show car’s technology combines power, comfort and efficiency. 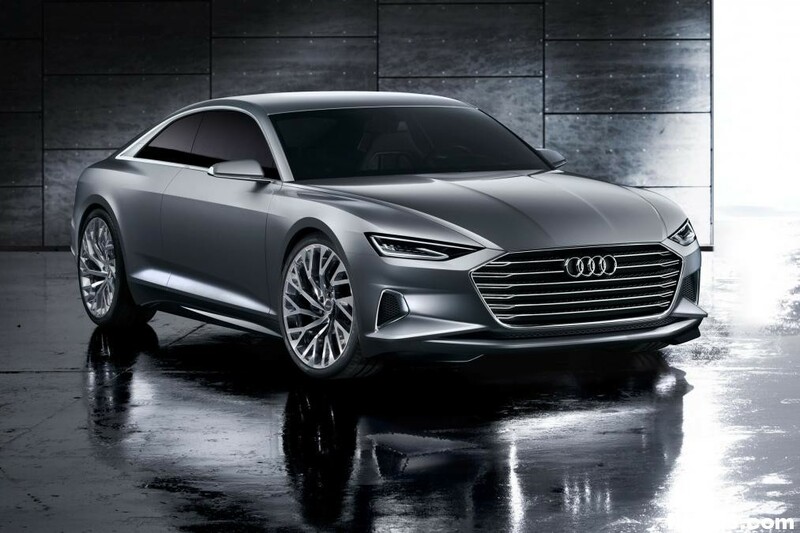 The 4.0 TFSI produces up to 605PS of power and 750 Nm (553.2 lb-ft) of torque; it accelerates the Audi prologue from 0 to 62mph in 3.7 seconds. Its dynamic all-wheel steering, in which the rear wheels can turn up to five degrees, makes the large couple extremely responsive and stable while driving. 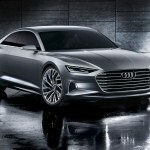 The Audi prologue is somewhat shorter and flatter than today’s production A8, with a length of 5.10 metres, wheelbase of 2.94 metres, width of 1.95 metres and height of 1.39 metres. A dominant feature at its low front end is a Singleframe grille displaying the four rings that is integrated into the automobile architecture. The large radiator grille has been widened much more, and it is positioned lower than on today’s production models. Its strong horizontal effect expresses an image of powerful dynamics. The cross bars have a finely structured diamond pattern, and their ends are split. The headlights – shaped like wide, flat wedges – are located with their tips above the Singleframe. 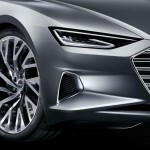 They present high-resolution Matrix laser technology: an innovation from Audi which opens up new approaches to headlight design and enables completely new functionalities. The pupils of the headlights are formed by a projection lens with a laser light source – they generate a matrix that illuminates the entire street in high resolution. Hovering beneath this element are five plastic lenses that are supplied with light via a glass fibre bundle, which are mounted to a lightweight structure and further extend the high-beam light. The new laser technology lets lighting designers create an extremely lightweight, compact and elegant eye-shaped form. 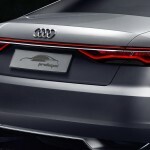 In side profile, its flowing silhouette expresses the character of forward motion in the Audi prologue. 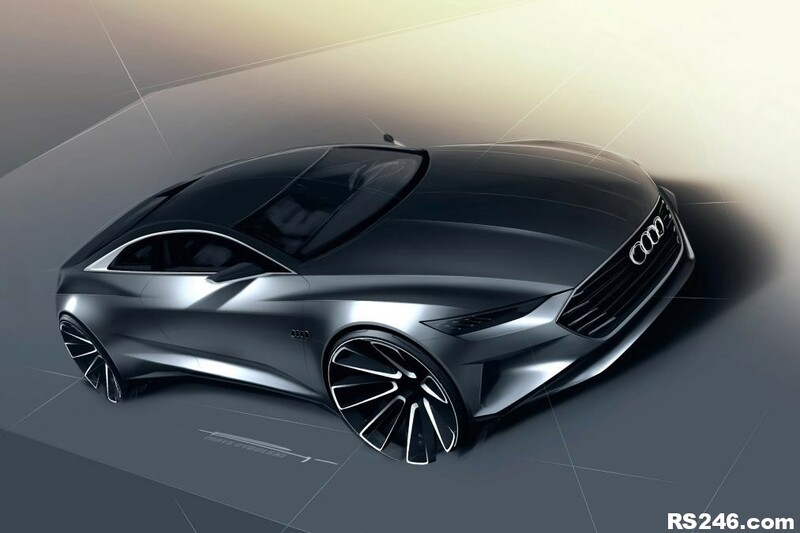 Balanced proportions put equal emphasis on the front and rear wheels – a clear reference to the quattro DNA of Audi. The powerful 22-inch wheels are set in widely flared wheel arches. They are fitted with tyres of size 285/30. Each wheel’s ten intertwining Y spokes project a filigreed, three-dimensional and powerful image. 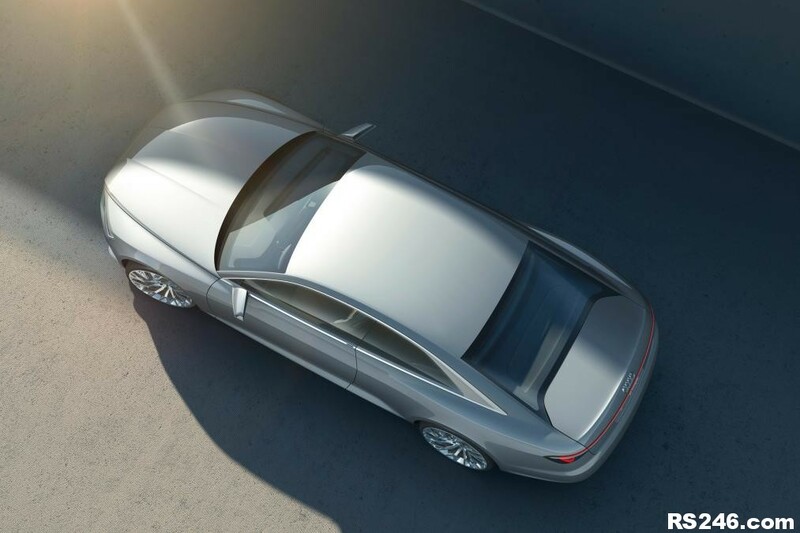 A characteristic feature of the Audi prologue are the flared shoulders above the wheels, front and rear. Like the blisters of the original Audi Ur‑quattro of the 1980s, they visualise the quattro drive – but they are no longer just added on, rather they are worked into the flow of the base architecture. In a side view, the shoulders form two gentle arcs above the wheels, which break up the somewhat lower shoulder line between the wheels. The wings, doors and rear side panels show curved muscular surfaces. The lower door area has a low concave shape that runs upwards to the rear – a motif that links to the design theme of air inlets. The side sills are drawn inward; glossy black aprons form a continuation of the front spoiler. 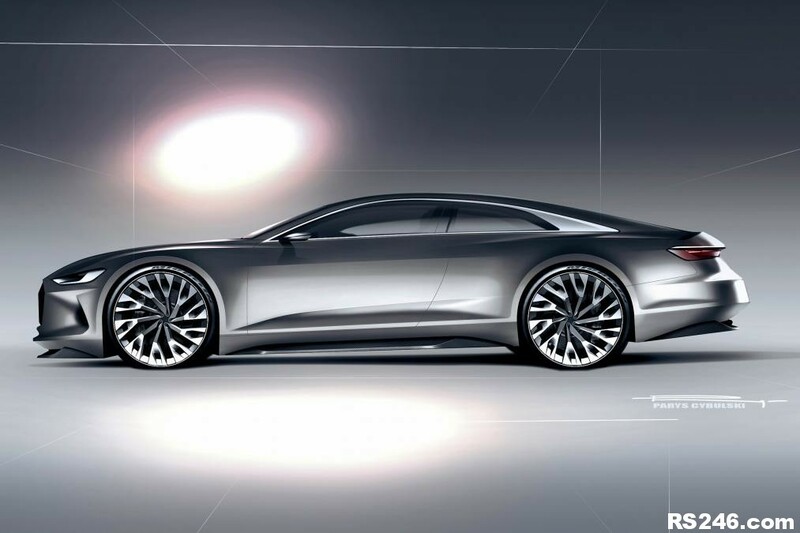 All lines and surfaces on the Audi prologue show car are logically interrelated, which is typical Audi. The door mirrors are small aluminium sculptures: The mirror housings in the form of a shell create a flowing transition to the window slot trim. They also integrate the open-door sensor surfaces. The doors have no handles, and they are opened electromechanically when the illuminated sensor surfaces are touched. 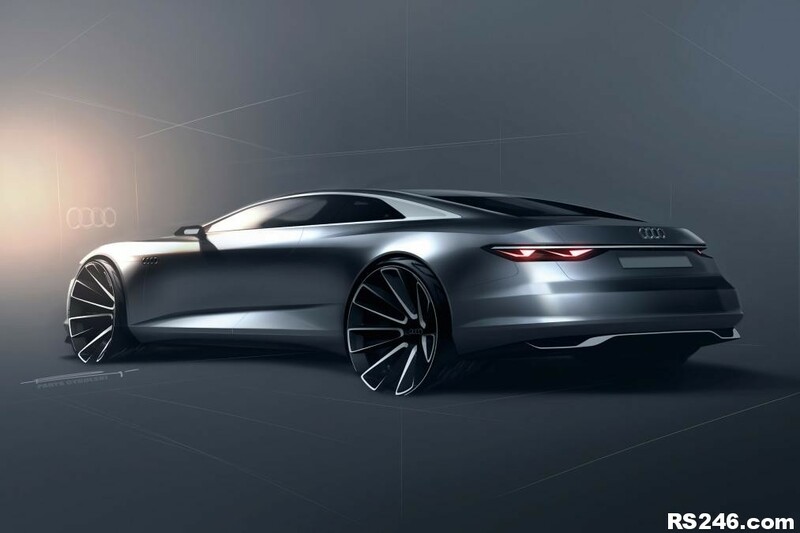 Vast areas of the stiff multimaterial body of the Audi prologue consist of aluminium and ultra-high-strength steel. The windows are framed by matt and polished aluminium trim strips. 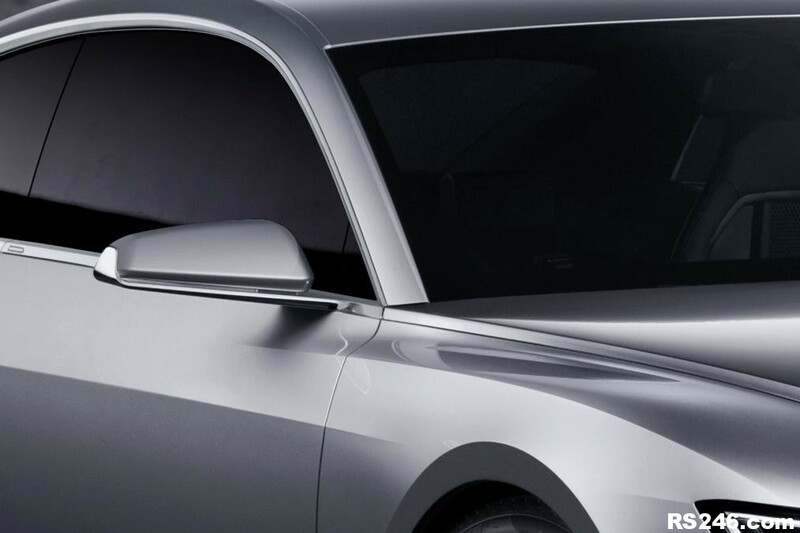 At the end of the low roof dome, the window framing transitions into a solid surface of aluminium; its workmanship illustrates the handcraft-like manufacturing quality of Audi, and it enables lowering of the windows despite the C-pillars. This area integrates the fuel tank lid on the right side of the show car. It has an electric opening mechanism and can be lowered completely into the C-pillar by pressing a button in the interior. For enhanced convenience in refuelling, the tank closure does not have a cap. The paint is a light diva grey, a new type of pearl effect paint, which has a warm and elegant appearance. 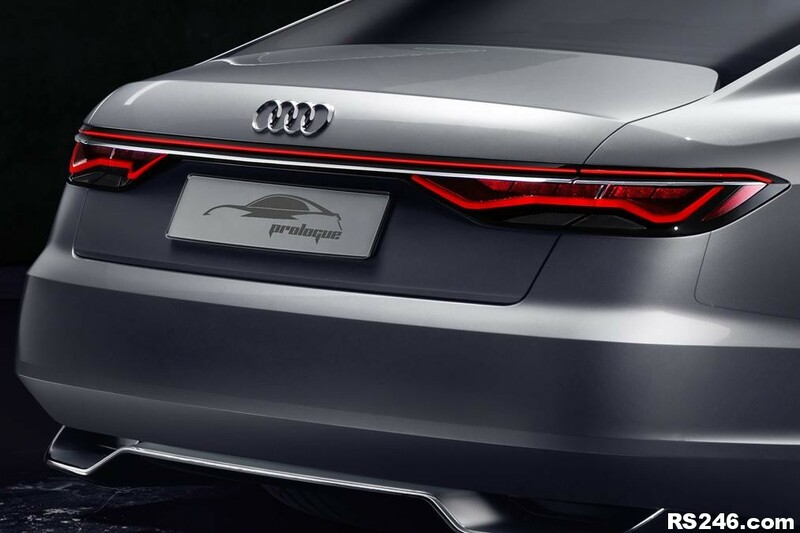 The rear section of the Audi prologue also breaks with conventions. It is angled in the driving direction and is reminiscent of the side and rear views of a luxurious yacht; the sickle-shaped seam between the side panel and the bumper emphasises this dynamism. The edge of the boot lid, which is executed as a discreet spoiler, picks up on the blister line coming from the side panel. Between the C-pillars, the rear window has a concave inward curve – it closes off the passenger compartment while enabling convenient cargo loading with the separate boot lid. 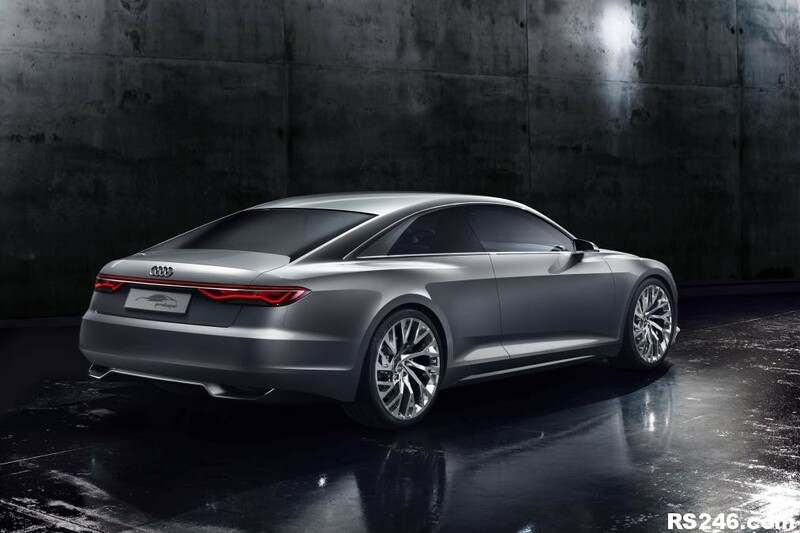 The Audi prologue unites the positive aspects of a saloon with the aesthetic highlights of a coupe. Beneath the bumper, there is a diffuser made of black anodised aluminium; like the front blade, it extends over the full width of the car as a separate, significantly recessed element. The diffuser integrates two trapezoid-shaped inlets which visually coordinate with the embossed tail lights and house the exhaust system tailpipes. The spacious interior of the Audi prologue is like a luxurious lounge. It is based on Gran Turismo design, and it enables both very focused driving and relaxed touring. 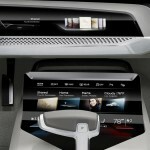 The interface visually adapts to the specific driving style. The interior marks the beginning of a new design era at Audi, in which the architecture merges with the operating concept to form one unit. The surfaces for displays and controls are innovatively integrated into the instrument panel and console of the centre tunnel, and the infotainment system brings driver and passenger into dialog with one another. When entering the vehicle, the four-seat coupe receives its passengers with polite hospitality. The “butler” – an innovative intelligent software program – identifies them based on their smartphones and adjusts the seats and climate control system according to their preferences. The system also makes recommendations for music and route planning that are oriented towards the owner’s preferences. The Easy Slot system, an advanced development of the Audi phone box, is located under lids in the centre console. A special mechanism networks the smartphones of passengers to the vehicle infotainment system and charges them. Tautly stretched lines and lean geometric forms give the interior a light and clear ambience. The instrument panel has a light and elegant appearance with its strictly horizontal layout that is not interrupted anywhere, and it emphasises the generous interior width. It lowers itself towards the interior on two levels. 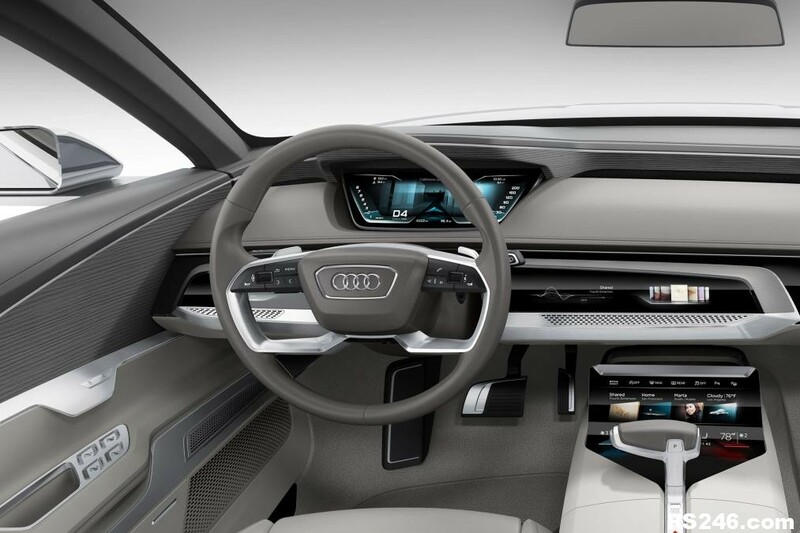 The upper level is positioned, like a roof, above the Audi virtual cockpit future – an advanced development of the Audi virtual cockpit – and above the line of air vents. It is part of the wrap-around – a large arc that encircles the driver and front passenger. A second wrap-around joins the front and rear sections of the interior and is already quite visible from the exterior. The centre console with its pass-through also appears to hover, as do the front seats, whose rails are mounted on the tunnel and side sills. The head restraints of the two rear bucket seats are lowered when not in use; they automatically extend when a passenger enters the rear seating area with the electric easy entry function. On the console of the centre tunnel, there is a fourth flexible touch display that is ergonomically adapted to the driver; it is used for climate control, handwriting input and other vehicle settings. This display consists primarily of an extremely thin, bendable OLED film (OLED: organic light emitting diodes), and it displays extremely sharp images that are rich in contrast. When not in use, the OLED display is integrated flush to the centre console and is nearly invisible. 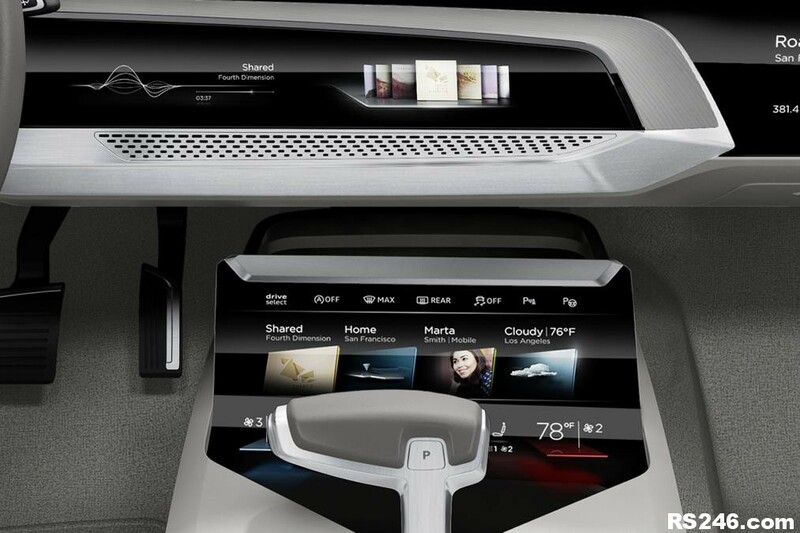 When the car is started, the flexible display stands up. The fact that it bends ensures a constant distance to the hand which makes for better ergonomics. When operating the display, the wrist rests on the low-positioned gear selector lever of the eight-speed tiptronic. Designers have also redesigned the shift-by-wire lever. It is now integrated seamlessly into the centre console. Cupholders and smartphone slots are installed under lids on the centre console, to the left and right of the console support element. The Audi virtual cockpit future offers a glimpse into the future of the digital cockpit: High-resolution displays and three mirrors generate a virtual stage on three levels – a fascinating view with visual depth. In the navigation view, the first level presents information that is important for driving; levels two and three generate the depth effect in the cockpit. Structuring the information on different levels makes it better organised and easier for the driver to comprehend. The content and colours of the Audi virtual cockpit future change as a function of driving style – when required, the display switches over to Sport mode with special presentation of the relevant information such as engine rpm, temperatures and charge pressure. 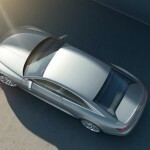 Inside the Audi prologue, every detail clearly illustrates its exclusive character. A finely crafted perforated panel covers the air vents. If the driver sets the blower to a higher stage, the panel retracts downwards. White LED light conductors trace the distinctive lines of the interior, starting at the doors. A large aluminium brace forms the steering wheel spokes; it harmonises with the bars on the displays and the door pull handles. All aluminium accents show perfection in craftsmanship: Their surfaces have matt finishes, and the edges are polished – a fine interplay of gloss levels. For Audi designers from the Colour & Trim area, natural materials are the new luxury; all of the materials in the show car fascinate with their authenticity. The surfaces of the seats and seat backs, the dashboard, the console on the centre tunnel and the armrests are covered in light-coloured “passion” leather – a new soft grade of leather that emphasises the natural characteristics of the animal hide. Soft nubuck leather, also in a light colour, covers the backs of the seats and the side panel trim of the rear seating area. On the instrument panel, the grey-brown trim of the lower section provides another strong accent. The wrap-around is upholstered in dark “passion” leather; here, and in many other areas, aluminium trim strips contrast with panels of open-grained silver-grey elm wood veneer. 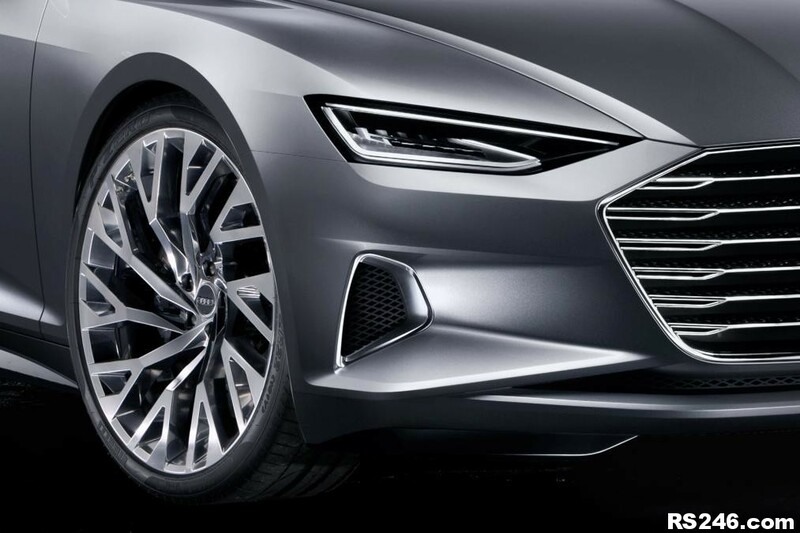 The technology of the Audi prologue is as sophisticated as its interior is emotion-evoking. The 4.0 TFSI, which is installed in the engine compartment like a technical masterpiece, produces 605 PS and 700 Nm (516.3 lb-ft) of torque; in overboost mode, which the driver can call up for around 15 seconds, a boosted torque of 750 Nm (553.2 lb-ft) is available. The sonorous biturbo V8 accelerates the two-door coupe, which has an unladen weight of 1,980 kilograms (4365.2 lb) from 0 to 62 mph in 3.7 seconds. The show car is capable of returning to 32.8mpg combined, which equates to CO2 emissions of 199 grams per kilometre. One contributor to this high efficiency is a new 48-volt subsystem of the vehicle electrical system – this is a technology that will soon be introduced to production cars at Audi. The 48-volt system is supplied by a powerful belt starter generator, which turns the powertrain into a mild hybrid and has an energy recovery output of up to 12 kW during braking. An eight-speed tiptronic directs engine power to the quattro permanent all-wheel drive, which works closely with torque vectoring. In the chassis, the adaptive air suspension sport – an air suspension with controlled damping – offers a large adjustment range between smooth rolling and very tight handling; it also varies the show car’s ground clearance over several levels. The front and rear suspensions are engineered as lightweight five-link designs. The large carbon-fibre ceramic brake discs decelerate the show car powerfully. On the 20-inch front brakes, they are gripped by six-piston fixed calipers. Overall, dynamic all-wheel steering – with rear wheel steering angles of up to five degrees – makes it easy to manoeuvre when parking and offers precise steering on country roads and impressively comfortable steering on freeways. **The fuel consumption and the CO2 emissions of a vehicle vary due to the choice of wheels and tyres. They not only depend on the efficient utilisation of the fuel by the vehicle, but are also influenced by driving behaviour and other non-technical factors.